Let’s start the week off with a before and after shall we? 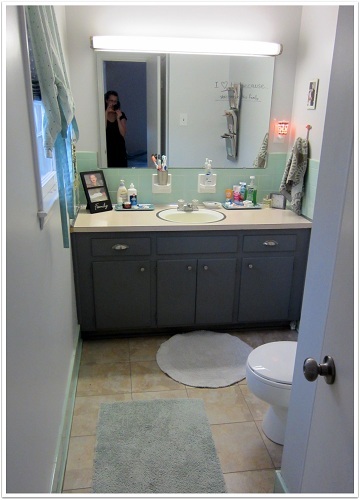 I have already shown you our main bathroom improvement and now I want to share how we updated our little half bath. 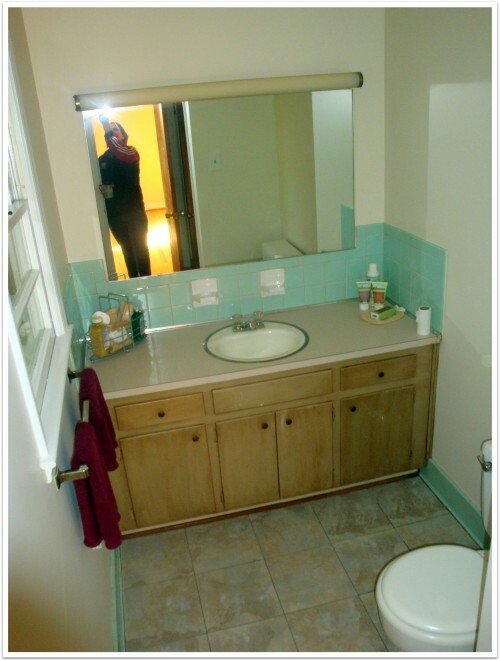 When we bought this house, we had big plans to rip out the giant counter top and replace it with a small shower and pedestal sink. We may still do that one day, but in light of other projects, this one got demoted. That doesn’t mean the room has to be a total loss though! A little bit of paint and some new hardware goes a long way. We painted the walls and cabinets with Olympic Zero VOC paint. 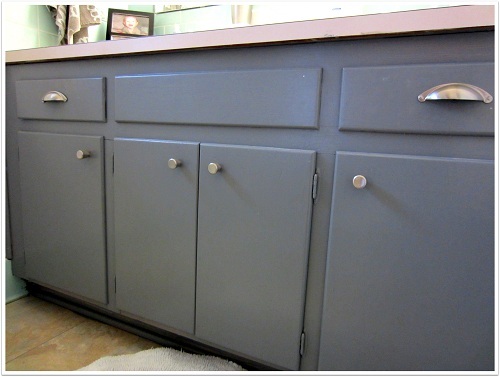 We used Thin Ice for the walls in eggshell finish and Dover Gray semi-gloss for the cabinets. We also removed the old school towel bar and added his and hers towel hooks on either side of the sink. Finally, we changed out all the old brass hardware for brushed nickel and painted the main door and closet doors white (visible in the reflection). While I would love to get rid of the giant florescent light, counter-top and sink and install my shower, the updates that we made on a budget will definitely help me wait it out. We already had the towels and curtain that magically matched the existing tile so it didn’t take much to bring it all together. 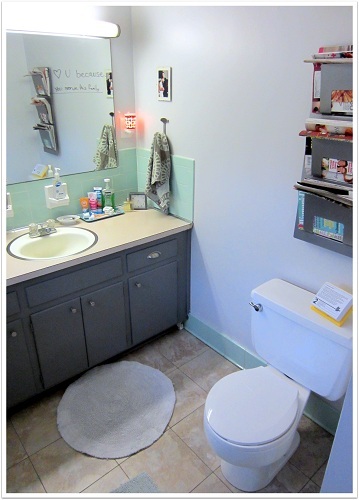 Our out-of-pocket cost was limited to paint for the walls and cabinets ($55), cabinet hardware ($10), wall hooks ($12) and a new toilet paper holder ($10). We also purchased the Ikea magazine rack ($10) for a grand total of $97 plus tax. Not too shabby! This is a bathroom I can live with. Are you working on any home projects? Awesome! love that grey combo! Looks great! I love the paint color. Love the color and the hardware you chose. Inquiring minds want to know-what does the mirror say? Thank you! The mirror note is an idea I got from pinterest! It says, “I love you because….” and my husband and I take turns filling in the blank. This week I wrote to him , “because you serve this family”. He has been working non-stop on our kitchen makeover! First, I love that you write on the mirror! Such a simple gesture that makes a big impact. 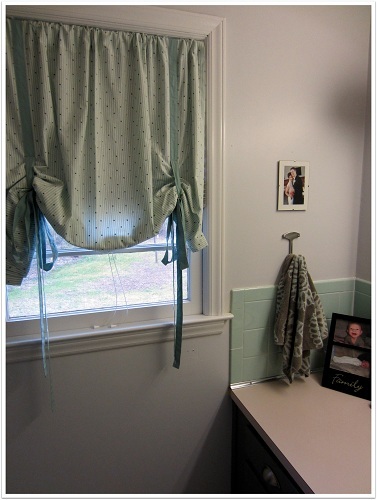 Second, you did a terrific job making updates and improvements on a budget, I like the paint, hardware, and curtain. Do you know how much you spent? I think that would be a nice addition to the post, under $200, etc. Some people, really have no idea, this can give them hope! Great idea Rajean! I just added the cost info to my post. Thank you! Looks great Andrea, well done. Wow! Less than $100! That’s awesome. Love the magazine rack idea! You rock, Andrea! I love how you balanced the green tile with the gray tones. Super smart! That is a huge half bath, in my opinion! As you know, mine is tucked under a stairwell, and most people think the door leads to the pantry… yipes! You definitely have room in there to make some cool changes… when you guys are ready. I enjoy seeing your transformations… especially that you are doing it a small chunk at a time. So often, I get down thinking that I have to do ALL our projects at once. Thanks for the inspirations!